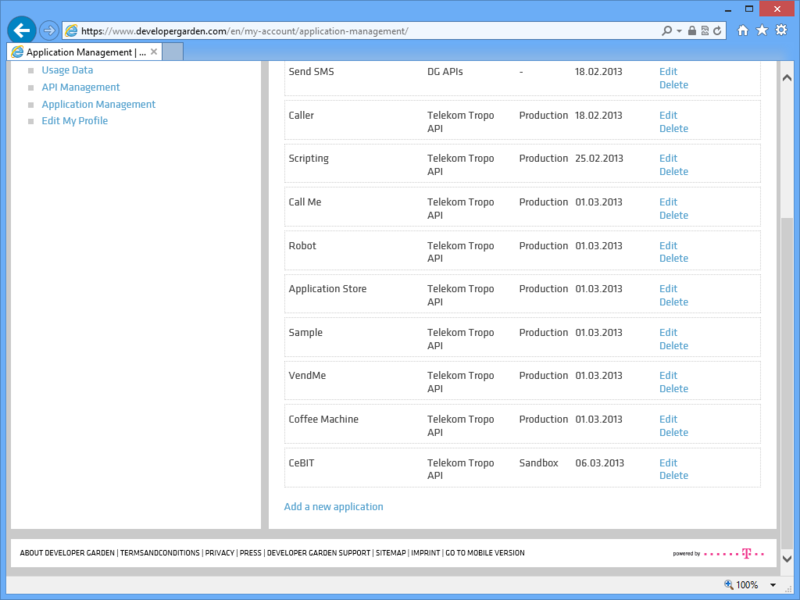 Since a few days there is a Scripting API for the Interactive Voice Response System (IVR) called Telekom Tropo. Thanks to this API it is easy to start immediately scripting your text messages without the need of a self-maintained infrastructure: All you need is internet access (which you probably have while reading this article) and a phone capable receiving text messages (SMS). 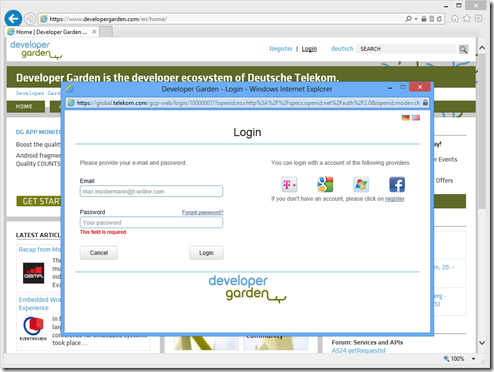 To start your first IVR project you need to be registered and logged in at Developer Garden. You find a detailed description of this 3-step-process in my blog. 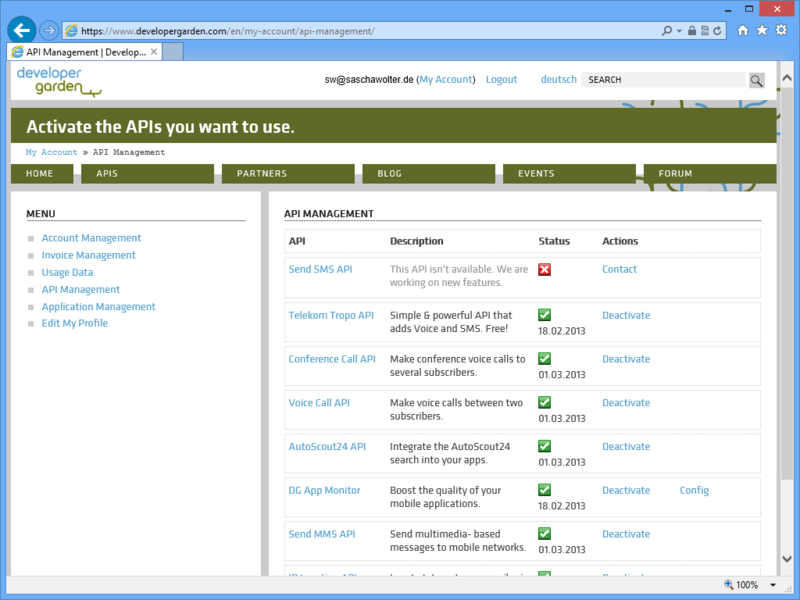 Once logged-in go to the “My Account” page and select the API Management to activate the Telekom Tropo usage. 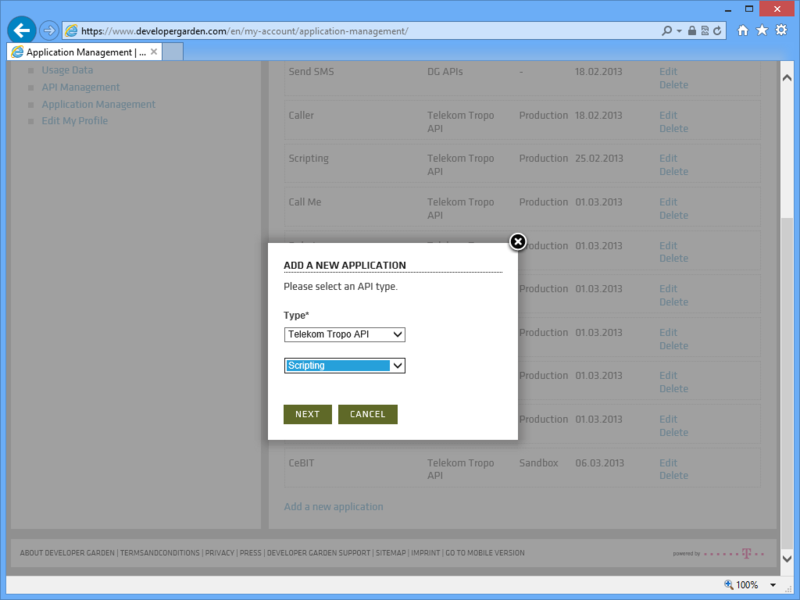 In this step you create your application. 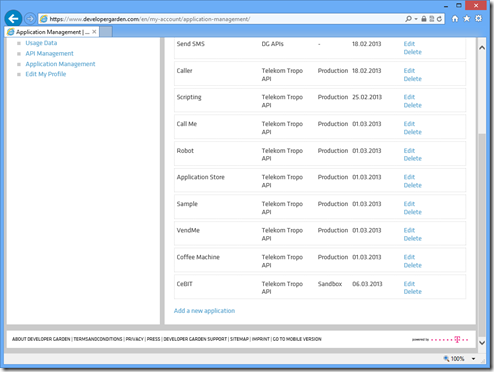 First select the Application Management. Please do not get confused because of the image above: I have already created a bunch off applications – in your case this dialog might be more or less empty. 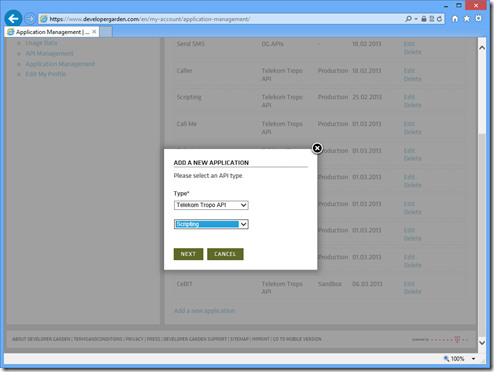 Finally click on “Add a new application”. 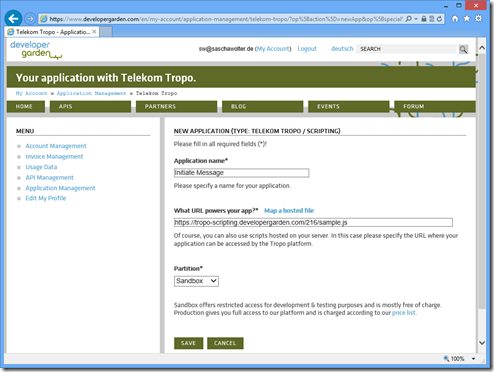 A dialog appears where you select the type of your application which indeed is Telekom Tropo here. 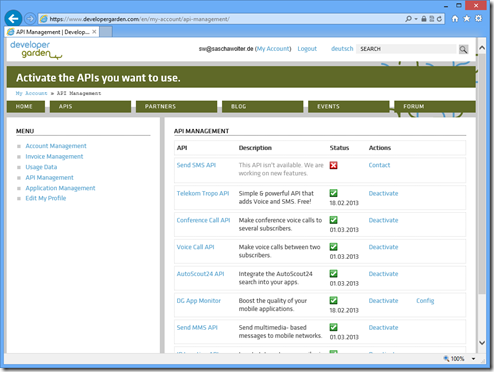 Furthermore you can choose Scripting or Web API. 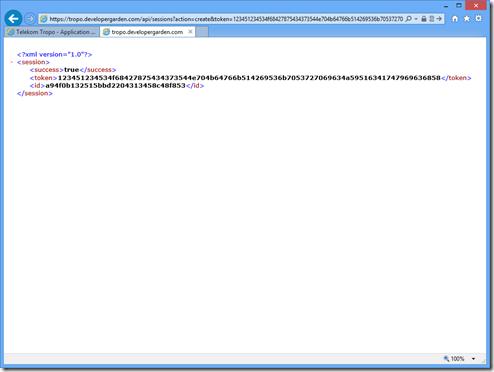 For this tutorial I recommend Scripting, because no hosting is required by you. And don´t worry, you can change this setting at any time. 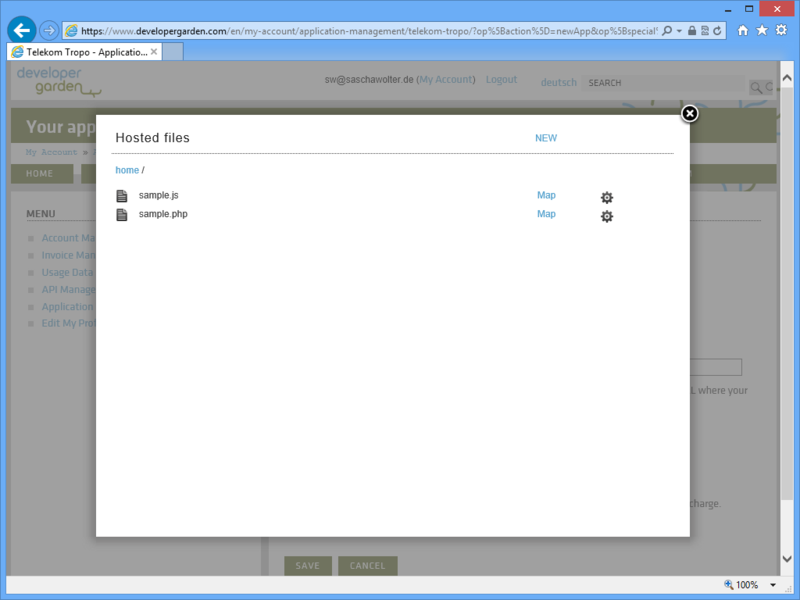 Using the Scripting API the hosting and maintenance is done by Developer Garden (the Scripting API allows hosting up to 200 MByte). 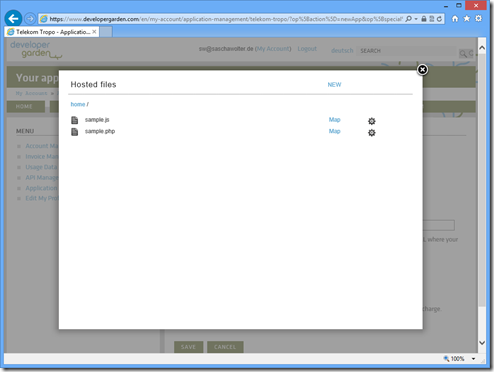 In the settings page of your application click on “Map a hosted file” to create, upload, edit or delete your code. For testing purpose we use the sandbox mode. This mode is free of charge, but has some limitations: E.g. 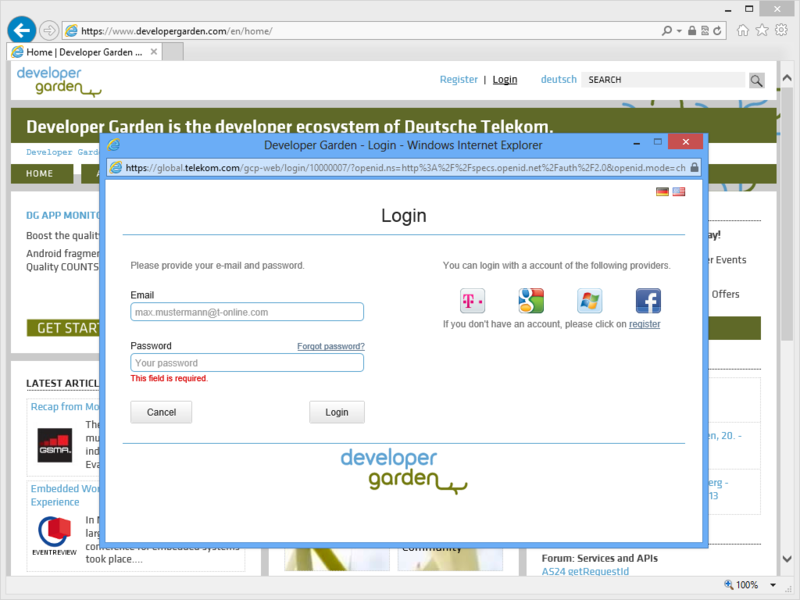 only 10 SMS per day are allowed and each SMS contains the text “SMS API by developergarden.com”. 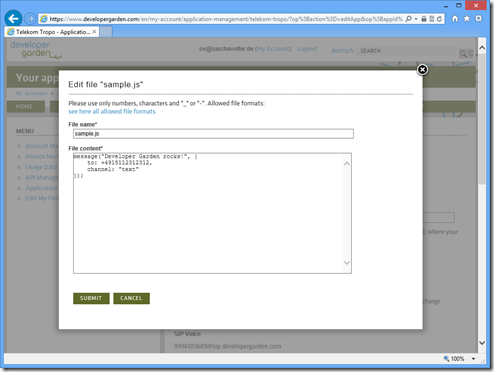 After you have created the file, an editor opens. To be honest, this editor is very rudimentary, but sufficient for simple scenarios (if you do not like it, use your own editor instead and upload the file here). Groovy: It’s built-in. Just write the Java code right in your Groovy. 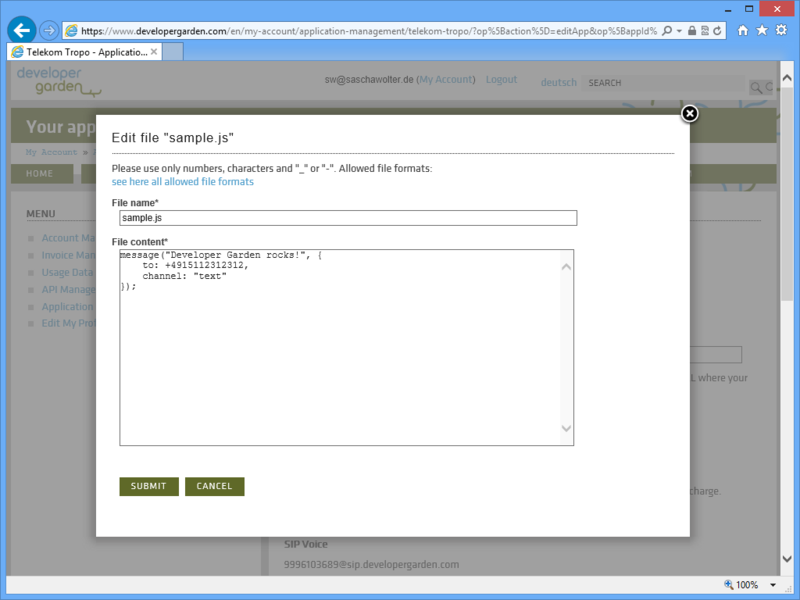 Finally submit your code and make sure to map the desired file clicking on “Map”. You have two options to use your application. 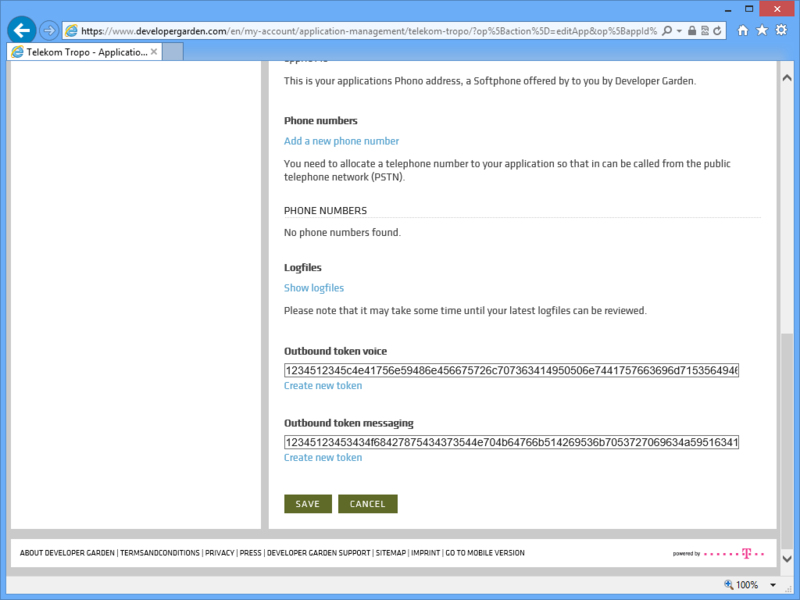 Either call a certain phone number (which you have to assign first in the applications settings) or just call a URI via the Telekom Tropo Rest API. 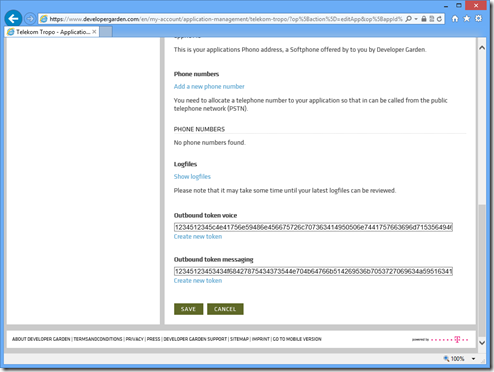 As long as you do not have a phone number to assign, we do the latter. The token is available in your applications settings. There you can create a new token as well. 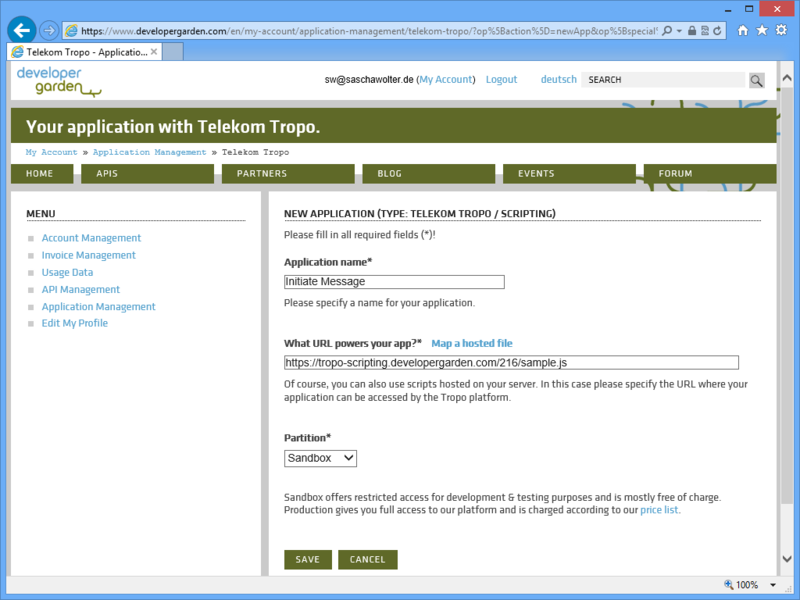 If you need further information or if you like to test an incoming call with a SIP client, please see the official Telekom Tropo documentation.